The Hunger Games: Catching Fire, part two in a series of filmed adaptations of Suzanne Collins’ phenomenally popular novels, is a hard movie to write about. The plot contains many clever twists, far more than the first film, and all of them are better left discovered by the viewer. Considering all the crushing action and sci-fi bores that bombard movie theaters year round, Catching Fire is a refreshing blast of inventive fun that bests its predecessor. 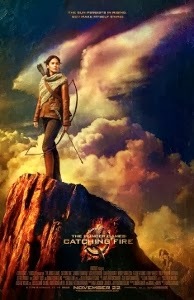 While it probably isn’t flattered by anything approaching in-depth analysis (something for which its most vocal haters cease to let it off the hook), this second adventure of Katniss (Jennifer Lawrence) and Peeta (Josh Hutcherson) is a very good popcorn movie. 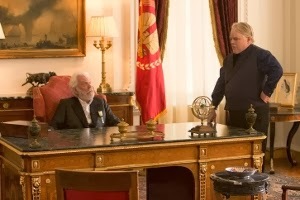 In a nutshell, President Snow (Donald Sutherland) is ticked off at Katniss for her little stunt during the 74th Hunger Games that kept both her and Peeta alive. Her brazen defiance of the last-man-standing objective has inspired uprisings amongst the inhabitants of the various districts of Penam. He wants the “couple” (they aren’t truly in love, it seems, but Snow forces them to pretend so during public appearances) dead, so he announces the 75th Hunger Games will be a Quarter Quell (which occurs every 25 years). Basically a special variation on the standard Games, each Quarter Quell has a unique twist. In this case, the tributes will be culled from the living group of previous winners (normally exempt from participation in further competitions). The upshot is that Katniss and Peeta will go against a wide variety of age-ranges, from the still-youthful Johanna (Jena Malone) and Finnick (Sam Clafin) to the middle-aged Beetee (Jeffrey Wright) and Wiress (Amanda Plummer). There’s even an old women in the mix, Mags (Lynn Cohen). Don’t worry, once the games are underway, Catching Fire avoids the trap of merely repeating what we saw the first time around. In fact, there’s a good deal of intrigue that kept me guessing (I’ve not read the books) until the very end. In addition to the many returning characters, including Haymitch (Woody Harreson), Katniss’ stylist Cinna (Lenny Kravitz) and chaperone Effie (Elizabeth Banks), plus ultra-smarmy broadcast host Caesar Flickerman (Stanley Tucci, hilarious again), there are some additional new faces in the supporting cast besides the aging tributes. Most notable is Phillip Seymour Hoffman as the new head gamemaker who devises the intricate playing field of the Quarter Quell. His backroom dealings with Snow provide some of the film’s more tantalizing moments, but unfortunately screenwriters Simon Beaufoy and Michael Arndt don’t capitalize on the potential for acting fireworks between Sutherland and Hoffman. Lawrence continues to dominate with another strong performance as Katniss. Perpetually caught between a rock and a hard place, she makes us feel the weight of the predicaments in which Katniss continually finds herself. Less successful is the once-again marginalized Liam Hemsworth as Katniss’ true love (or is he? 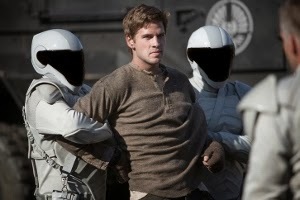 ), Gale Hawthorne. Given not much more to do than in the first film, Hemsworth does at least get one fairly intense scene in which he’s publically flogged after trying to defend an old woman. The whole love triangle between Katniss, Gale, and Peeta is not particularly well-handled by director Francis Lawrence (who will return to the helm for the two-part conclusion, Mockingjay), but with all the surrounding action it’s no wonder Catching Fire doesn’t present much subtlety. In a way, it does effectively present the same kind of distraction the Hunger Games are intended to provide the people of Penam. It may ultimately lack depth, but that doesn’t disqualify it from being satisfyingly entertaining.